Machu Picchu is considered to be one of the new 10 Wonders of the World and the legendary Inca Trail, a 4 day and 3 night trek following the old Inca road, is the most popular way to reach the site, taking in several smaller archeological sites along the way and reaching Machu Picchu for sunrise on day 4. Over the last 10 years or so the Inca Trail seems to have become a victim of its own success. Several years ago it became necessary to limit the number of trekkers using the trail as the sheer volume of traffic meant that the ruins were being damaged, litter was becoming a problem and sanitary conditions were appalling. The quota is now 500 people per day, which, along with trekkers, includes guides, porters and cooks. The measures taken were required to preserve Machu Picchu, but the outcome has been devastating for the humble backpacker with prices for the trek going through the roof and the waiting list to join the trek extending to 5 or 6 months in some cases. 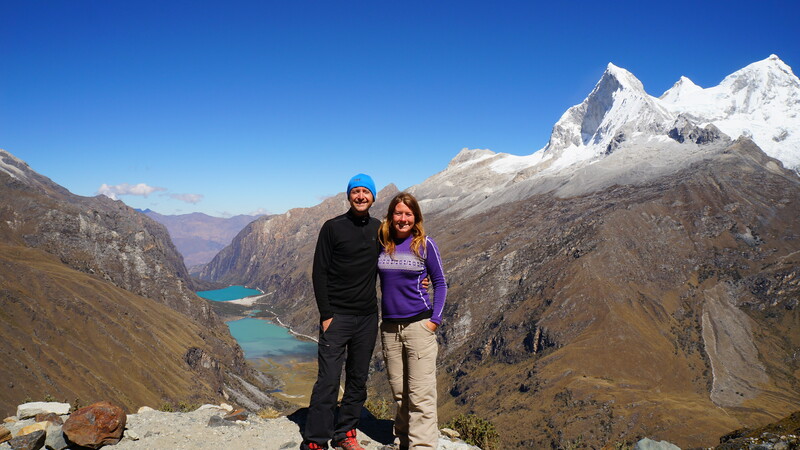 With all of this considered, we decided to try one of the many alternative treks, which offer equally as stunning scenery and the chance to visit small villages before ending up at Machu Picchu on the ultimate day. The alternative trek we chose was the Salkantay trek which traverses snow-capped mountain ranges, passes turquoise lagoons and hot springs, and descends into lush jungle before spending one night at a small town called Aguas Calientes and rising early the following morning for sunrise at Machu Picchu.